* DXer: The Blind Sheik’s Lawyer Montasser Al-Zayat Announced In 1999 That Ayman Zawahiri Would Use Anthrax Against US Targets To Retaliate For Imprisonment Of Senior EIJ Leaders, Most Notably Blind Sheik Abdel-Rahman « CASE CLOSED … what really happened in the 2001 anthrax attacks? « * GAO: Is Tariq, the suspected al Qaida anthrax operative residing in New York identified by Saifallah Paracha, the same “Tariq” as associated with a notation for the anthrax vaccine and the same as the businessman in the pharmaceutical industry? Or do these references refer to more than one Tariq. This entry was posted on June 3, 2013 at 6:21 am	and is filed under Uncategorized. Tagged: Montasser Al-Zayat, Sheik Abdel-Rahman. You can follow any responses to this entry through the RSS 2.0 feed. You can skip to the end and leave a response. Pinging is currently not allowed. In Tunisia, in the 19 letters, was it traces of ricin rather than traces of anthrax? If we are to learn anything more on this report of letters (containing traces of ricin?) sent in Tunisia, Florian Flade may have reliable insights. I don’t know if there is a connection between the matter in Tunisia and the matter last year in Germany. But I expect that if we are to learn anything, it will come from someone who provides such detailed and interesting factual narrative. Would we be surprised to learn that there was a similar threat with respect to the pending prosecution in Tunisia? My Note: I agree that such letters, whether hoax or actual, are pointless and commonly have the opposite of the intended effect. In the case of the Fall 2001 anthrax mailings, 99+% of observers did not realize that Zawahiri, through surrogates, had ANNOUNCED his EXPRESS intention to use anthrax to retaliate for the detention of the Blind Sheikh. (This included all of the US press even to this day — go figure). Of course, a motive may be mixed. ANTHRAX TOXIN LETTERS (02): (TUNIS) SOURCE IDENTIFIED, PURPOSE? Tunisia’s Criminal Court on terrorism cases in the capital’s Court of Appeal has sentenced 31 people to death over the 2014 terrorist attack on the house of former Interior Minister Lotfi Ben Jeddou. Among the 31 suspects are Seifallah Ben Hassine, known as Abu Ayyad, an associate of late al-Qaeda leader Osama Bin Laden and founder of the militant group Ansar al-Sharia. He is also the main suspect in a series of terrorist acts, including the assassination of Tunisian leftist Chokri Belaid and MP Mohamed el-Brahmi. The 31 suspects, who include Algerians as well as Tunisians, were sentenced in absentia. Some of them are reportedly dead. Algerian Khalid al-Shayeb, known as Luqman Abu Sakhr, was among them. He was allegedly killed in 2015 during armed clashes in the Gafsa region of southwestern Tunisia. The court also sentenced one defendant to 3 years in prison and 7 others to 10 years, while a number of other suspects received 20-year or life sentences. In addition, the Tunisian judiciary acquitted 7 defendants of terrorism charges. In May 2014, a terrorist group attacked Ben Jeddou’s house in Kasserine, killing 4 Tunisian security agents and injuring several others. In other news, 19 letters [sic, 20] containing potentially deadly toxins addressed to prominent journalists, politicians, and trade unionists have been intercepted by police at the central post office in Tunis and taken for testing. The National Unit of Investigation for Terrorist Affairs and Organized Crime revealed that the toxic substance was made in Tunisia inside a laboratory. The Ministry of Interior indicated that it is monitoring the movements of the terrorist cells that plotted the attack, especially [given] that the deadly poison was made with local Tunisian expertise and required huge financial support. “Our team was on heightened alert for more than shaky buildings and falling glass. Behind the scenes and known only to a few, government officials feared a second attack — one completely different from the violent, earthshaking events of 9/11. An assault so quite it would not be noticed until its lethal efforts emerged days later. Late on September 11, with the help of Epidemic Intelligence Service Investigators from the Centers for Disease Control, the public health department had placed New York City area hospitals under a twenty-four-hour watch. By September 14, they had instituted a citywide syndromic surveillance system, monitoring more than two dozen hospitals for any illness resulting from biological terrorism. The same scrutiny was in place around the Pentagon, the site of the third commercial airliner attack thirty-four minutes after the second World Trade Tower was hit. Comment: John Ezzell, who has been very forthcoming with this blog and demonstrated himself to be a man of great integrity in speaking before the filmed conference moderated by Lew Weinstein. He worked closely with Decker’s FBI unit, had made a dried powder out of Ivins’ Flask 1029. Decker can explain why the FBI never has acknowledged this fact. Ezzell’s lab did not submit a simple from Flask 1029 that it had in its unlocked refrigerator in 1412 — and then inexplicably threw out Ivins’ submitted sample. Somehow Decker construed this as evidence of Ivins culpability when instead it pointed to a conflict of interest that was off the Richter scale. It constituted a breath-taking conflict of interest. The reason I knew of Zawahiri’s threat that anthrax would be used to retaliate for the rendering of the Blind Sheik and other Egyptian Islamic Jihad leaders was because in 2001 I read the publicly available, CIA FBIS system, courtesy of a local University. The database was available at both SU and Cornell, and I used it at both places. The database later was made a paid service through DIALOG. Yes, the report appeared in the national news that day. So anyone watching the news (as everyone was) would have known that. The claim of Zawahiri’s intention to use the anthrax had been published a long time before. In fact, the issue had been the subject of letters between Bin Laden and a radical imam in Europe. At one point, Bin Laden had posted his response to the request that biological weapons be used. Bin Laden’s position was always that he would use biological weapons in a manner and under the circumstances of his own choosing, and that it was permitted as a defensive measure. At one point, Bin Laden’s letter had been posted on the internet but the CIA had it taken down. In announcing an Ivins Theory in early August 2008, the FBI stupidly used Ivins’ email as somehow demonstrating an undue interest in the subject and evidencing guilt of murder. No. It was evidence that he read or watched the news — it appeared in both print and broadcast that day. Michael B. Mukasey has an OpEd in the WSJ today on the subject of Mueller and Amerithrax. Mukasey was the United States District Court Judge in the trial of the Blind Sheik and his followers. He then was Robert Mueller’s boss at the time the FBI announced its Ivins Theory at a press conference in early August 2008. Comment: Great detectives, rather bullshitting unduly about motive, set about determining the anthrax strain that the people who had announced an intention to use anthrax against US targets were using. Now, the FBI did not issue a press release or leak Zawahiri’s announced motive. But should they have to? Given that we all can research and read? The French are the worst on the motive — with a large percentage thinking that Al Qaeda was not responsible for 9/11. CAIRO (Reuters) – Al Qaeda leader Ayman al-Zawahiri has urged Egyptians to topple their government in the second message from Islamist militants this week calling for violence … In an undated audio recording, the Egyptian-born Zawahiri did not issue any specific threat, and did not mention any election. From an August 2017 interview of Dr. Zaki of the CDC. Comment: It wasn’t foresight so much as intelligence based on open source accounts of what Zawahiri’s captured military commander Mabruk was saying. The EIJ military commander (and Zawahiri’s confidante) Mabruk was captured in Azerbaijan (reportedly by the CIA) in 1998 and his laptop seized. His laptop identified 100 targets against which Zawahiri might use biological weapon. Mabruk, along with al-Najjar and the blind sheik’s lawyer Montasser Al-Zayat, were the ones publicly announcing Zawahiir’s intentions in public at their 1999 trial, but the same had been gleaned from their interrogation in Egypt and the contents of Mabruk’s laptop. On December 1, 1996, Mabruk and Mahmud Hisham al-Hennawi – both carrying false passports – accompanied Ayman al-Zawahiri on a trip to Chechnya, where they hoped to re-establish the faltering al-Jihad. Their leader was traveling under the name Abdullah Imam Mohammed Amin, and trading on his medical credentials for legitimacy. The group switched vehicles three times, but were arrested within hours of entering Russian territory and spent five months in a Makhachkala prison awaiting trial. The trio pleaded innocence, maintaining their disguise and having other al-Jihad members from Bavari-C send the Russian authorities pleas for leniency for their “merchant” colleagues who had been wrongly arrested; and Russian Member of Parliament Nadyr Khachiliev echoed the pleas for their speedy release as al-Jihad members Ibrahim Eidarous and Tharwat Salah Shehata traveled to Dagestan to plead for their release. Shehata received permission to visit the prisoners, and is believed to have smuggled them $3000 which was later confiscated from their cell, and to have given them a letter which the Russians didn’t bother to translate. In April 1997, they were sentenced to six months, and were subsequently released a month later and ran off without paying their court-appointed attorney Abdulkhalik Abdusalamov his $1,800 legal fee citing their “poverty”. Shehata was sent on to Chechnya, where he met with Ibn Khattab. Zawahiri and Mabruk accompanied al-Hennawi to Baku, Azerbaijan where he’d managed to secure himself a position. 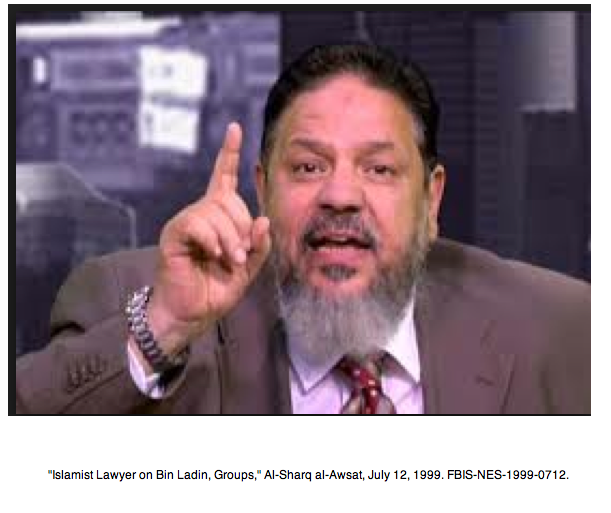 In June 1998, tired of Mabruk’s criticisms of his relationship with Bin Laden, al-Zawahiri allegedly banished him from al-Jihad’s central operations. He subsequently remained in Azerbaijan when Zawahiri left, and set up his own militant cell under the Bavari-C name, replacing Eidarous as the regional commander, after his transfer to London. In August 1998, a wiretapped phonecall tipped off the Israeli Mossad that a rendez-vous between Ihab Saqr and an Iranian MOIS official was planned in Baku, Azerbaijan. Without a bureau in Azerbaijan, they contacted the American CIA, who allowed a Canadian-raised Mossad agent to unofficially tag along as seven or eight CIA officers based in Frankfurt oversaw a local police raid on the Baku hotelroom on August 20. When the Azeri police received confirmation that Saqr was in his hotelroom drinking coffee with others, they stormed the room grabbing all three people they found present and brought them still barefoot to the police station. It was now realised that the Iranian official hadn’t yet shown up, and they had instead arrested Saqr, as well as Mabruk and Essam Marzouk. They were brought to the police station, where the Mossad agent says the police “beat the crap out of them”. His laptop computer was seized, and yielded information on an Albanian cell, leading to a raid which saw five more arrested and extradited to Egypt. It also ostensibly confirmed the identity of more than a hundred others who were, or had been, arrested based on their links to the group. An alternative telling of his arrest suggests that he had been arrested outside a Baku restaurant after American authorities had been tipped off by an informant inside al-Jihad. I believe CNN national security commentator and “Security Mom” author Juliette Kayyem (HLS ‘ 95) was working for Rep. Gephardt in 1999 in profiling the emerging terrorist threat when this threat was made. It would be interesting to hear if she imagines that the pronouncement by the Blind Sheikh attorney that Zawahiri would use anthrax — made at the same time that the detained Egyptian Islamic Jihad leaders Mabruk and Al-Najjar were saying the same thing — was an empty threat. …whether she thinks Ayman Zawahiri was a fellow who didn’t try to execute on his threats. Former NYC Police Commissioner Ray Kelly, said to be under consideration by President Trump to replace FBI Director Comey, has written a book. Two-time New York City police commissioner Ray Kelly opens up about his remarkable life, taking us inside fifty years of law enforcement leadership, offering chilling stories of terrorist plots after 9/11, and sharing his candid insights into the challenges and controversies cops face today. The son of a milkman and a Macy’s dressing room checker, Ray Kelly grew up on New York City’s Upper West Side, a middle-class neighborhood where Irish and Puerto Rican kids played stickball and tussled in the streets. He entered the police academy and served as a marine in Vietnam, living and fighting by the values that would carry him through a half century of leadership-justice, decisiveness, integrity, courage, and loyalty. Kelly soared through the NYPD ranks in decades marked by poverty, drugs, civil unrest, and a murder rate that, at its peak, spiked to over two thousand per year. Kelly came to be known as a tough leader, a fixer who could go into a troubled precinct and clean it up. That reputation catapulted him into his first stint as commissioner, under Mayor David Dinkins, where Kelly oversaw the police response to the 1993 World Trade Center bombing and spearheaded programs that would help usher in the city’s historic drop in crime. Eight years later, in the chaotic wake of the 9/11 attacks, newly elected mayor Michael Bloomberg tapped Kelly to be NYC’s top cop once again. After a decade working with Interpol, serving as undersecretary of the Treasury for enforcement, overseeing U.S. Customs, and commanding an international police force in Haiti, Kelly understood that New York’s security was synonymous with our national security. Believing that the city could not afford to rely solely on “the feds,” he succeeded in transforming the NYPD from a traditional police department into a resource-rich counterterrorism-and-intelligence force. In this vital memoir, Kelly reveals the inside stories of his life in the hot seat of “the capital of the world”-from the terror plots that nearly brought a city to its knees to his dealings with politicians, including Presidents Bill Clinton, George W. Bush, and Barack Obama as well as Mayors Rudolph Giuliani, Bloomberg, and Bill DeBlasio. He addresses criticisms and controversies like the so-called stop-question-and-frisk program and the rebuilding of the World Trade Center and offers his insights into the challenges that have recently consumed our nation’s police forces, even as the need for vigilance remains as acute as ever. Ayman al-Zawahiri’s calls come as al-Qaeda urges followers to carry out lone wolf attacks during Olympics. Al-Qaeda leader Ayman al-Zawahiri has urged militants to kidnap Westerners and swap them for jihadi prisoners, according to the SITE Intelligence Group. The chief of the terror organisation made the proclamation in a recording which was posted online. IBTimes UK could not independently verify the recording. Earlier this week The Foreign Desk obtained material revealing the jihadist group had called on its followers to perpetrate lone wolf attacks during the 2016 Olympic Games in Rio de Janeiro, which are set to get underway in less than a fortnight on 5 August. Anyone else feel that Dr. Ayman Zawahiri is pretty irrelevant in an age of natural disasters and random violent crime? As to the Olympics, he is literally less significant than a mosquito. We have more shootings on a nightly basis in my small city that his worldwide following commits in a week. He instead should concentrate on reading to his grandchildren. While in the John E. Polk Correctional Facility in Seminole County, Robertson was considered so dangerous, he was kept in shackles and assigned his own guards. Whenever he was transported to court, a seven-car caravan of armed federal marshals escorted him. He was initially moved into solitary confinement after prison authorities believed he was radicalizing up to 36 of his fellow prisoners. During the same period, federal authorities claimed Robertson served as a bodyguard to Omar Abdel Rahman, nicknamed the “Blind Sheik,” who led the terrorist group that carried out the 1993 bombing of the World Trade Center and donated more than $300,000 in stolen funds to mosques he attended, both claims Robertson denied. Robertson has adamantly denied the claims. After he was arrested in 1991 along with most of the other members of the gang, prosecutors cut a deal with Robertson, and let him serve four years in prison before going to work undercover for the FBI between 2004 and 2007 to document terrorists’ plans and networks in Africa, Egypt and the United States. Mabruk, captured by the CIA in 1998, had anthrax planning documents on his laptop. He said Zawahiri was planning to use anthrax. .
Is Ayman Zawahiri going to be killed tomorrow? It seems that authorities have had success in targeting some individuals who reported directly to him. Al-Qaida chief Ayman al-Zawahiri had said, in a video message, the new chapter would take their fight to Myanmar, Bangladesh and India. “One of the four terrorists killed on Monday during a raid of law enforcement agencies near Lahore was the head of Al-Qaeda networks in Pakistan and in Punjab province,” Khanzada said. The minister also claimed that Al-Qaida network’s Indian sub-continent head Maulana Asim Umer is an Indian national who is hiding in Afghanistan. Earlier, American national Mahmood was the head of Al-Qaida’s network in the sub-continent. He was killed in a drone attack. Al-Qaida’s leader Ayman al-Zawahri had announced the creation of al-Qaida in the Indian sub-continent in September. The raid on Monday was the first known operation against the group in Lahore. This trial likely is weighing heavily on Dr. Ayman. Cairo Criminal Court postponed Sunday the trial of 68 defendants of “Al-Zawahiri cell” to 31 May. The defendants are accused of establishing and managing a terrorist organisation linked to Al-Qaeda. They would have conduct attacks on army and interior ministry officers, in addition to Christians and their houses of worship. They are also accused of committing “terrorist acts” with the aim of spreading chaos in the country. Among the defendants is Mohamed Al-Zawahiri, brother of Al-Qaeda leader Ayman Al-Zawahiri. Out of the 68 defendants, 18 are still at large. The new FBI 911 Commission Report (p. 103) discusses a planned attack on a Los Angeles Masonic Lodge that was approved by Al Qaeda’s spiritual leader, blind Sheik Abdel-Rahman in 1992-1993. Adnan El-Shukrijumah was in Brooklyn with the Blind Sheik Abdel-Rahman — he was the son of the Blind Sheik’s translator. 337 (U) Memorandum for the Record, October 24, 2014. 339 (U) Guy Taylor and John Solomon, “EXCLUSIVE: FBI had human source in contact with bin Laden as far back as 1993,” Washington Times, February 25, 2014, http://www.washingtonstimes.com/news/2014/feb/25/fbi- source-had-contact-with-osama-bin-ladin-in-1993 (accessed on November 19, 2014). Does Ayman Zawahiri strike you as someone who doesn’t follow through on his threats? On what evidence? The former blind sheik lawyer was sentenced to 18 months yesterday here in Syracuse by a federal district court judge who denied Stanley’s request for an additional several week delay. Stanley Cohen, the lawyer, was sentenced by U.S. District Judge Norman Mordue in Syracuse, New York, after pleading guilty earlier this year to obstructing and impeding the Internal Revenue Service and willful failure to file income tax returns. — his treat, under the circumstances — but it didn’t happen. It’s not like Dr. Ayman Zawahiri or Yazid Sufaat or even former Brooklynite Adnan El-Shukrijumah know Stanley or share with him. So Stanley would know only what he reads in the newspapers. In any event, lawyers lie to themselves before their clients ever do. Stanley’s got more fortitude than me. I would be drinking Dos Equis on some Ko Samui beach for the duration before I reported to jail. The sentencing is not going forward today. What are the odds Stanley will go on the lam? He hates the US. He owes a bucket of money that he has to pay back with penalties. (I believe that is a necessary pre-condition of getting the 18 months). And of course, then there is the going to jail part. He likely still rents in NYC. He likes hanging out with fellow, educated supporters of Hamas. He saw how hard health-wise jail was for Lynne Stewart. He communicates widely through electronics or through travel abroad. He can follow the Yankees and write his book from abroad. So while I guess he is just trying to making arrangements to pay and/or engaged in a related negotiation over the details of repayment — and taxpayer privacy justifies the sealing — what would the scenario look like if he was just going to be a no-show? And go on the lam? Wouldn’t it look exactly like what we are seeing? I think the chance of him cooperating — which is what I would want and why it is of such great interest to me — is pretty much nil. But if it turns out he cannot pay the huge amount he owes, isn’t the deal off? And where is going to come up with the money if he was behind on his rent? I’ve always been interested in the loquacious and tenacious Mr. Cohen because I blog about the anthrax mailings and I think they were committed by someone associated with Brooklyn-based Blind Sheik Abdel-Rahman’s Services Organization (to wit, Adnan El-Shukrijumah is the anthrax mailer). The GAO is going to issue a report that reviews the FBI’s case in Amerithrax later this Fall. I think the mailer was the son of the Blind Sheik’s translator, Adnan El-Shukrijumah, and I think in the Virginia Paintball case the FBI was working an anthrax lead. See Wash Po “Hardball” article discussing Wade Ammerman and his colleagues efforts. I think Attorney Cohen knows all this because he’s not stupid. Indeed, Stanley himself thinks he was targeted by Gordon who is the lead prosecutor in US v. Al-Timimi. For a while, Stanley represented Ismail Royer, who led the young men in the paintball group. I’m not political (or jewish) and am just interested in the whodunnit of the anthrax mailings — but I think it would be very exciting if Stanley went on the lam and could be part of an international manhunt. But he would have a world audience with his cogent, testosterone-laden 140 character blasts. Off to a meeting. For the 327,459th time I support the armed struggle of the Palestinian Resistance- that means Hamas. Do lawyers get a pass because they are such useless tools? My new court date is the 31st of October. Summary Criminalizing Speech … Teaching a Terrorist … Tilting at Straw Men Some Straw Men . . . This summary is from a long time ago and I don’t know what the current law is. But it seems to thoughtfully raise the issue of criminalizing free speech. When I knew Mary she was always the one among us who was knowledgeable about criminal law. So let’s see what she said at the time about criminalizing speech and what constitutes material support. Certainly, I would think, it does not constitute material support to be gracious or think that the person comes from a nice family — such as Stanley has said of Al Qaeda spokesman Abu Ghaith and his family. Or I have said of the Al Qaeda anthrax lab director Yazid Sufaat and his family. Yazid Sufaat was happy with the anthrax work when he stayed with KSM for 6 days in 2001 and when he reported to Dr. Ayman on the results of his research with virulent anthrax in August 2001 with Hambali; in his correspondence with DXer, he seems happy today also (and very much in love). But at what point does Attorney Cohen’s support and advice to Hamas go beyond protected free speech? (I have no idea and it is beyond the scope of the blog.) But I believe Hamas is a designated terrorist organization in the US and a number of other countries. Personally I don’t know why Attorney Cohen would be returning to the US. Hamas is not a designated terrorist organization in a number of countries, to include a number of Arab countries. So why wouldn’t he settle somewhere outside the US doesn’t have an extradition treaty? Why does one show up for jail when one can simply make a nice life in another country? Was it wise to allow him to travel when so much money was owed — with the 18 months entirely conditional on the payment of the money owed, including penalties? In hindsight, although we don’t have the benefit of knowing what the sealed letters are about, was he a flight risk? There is a renewed petition effort on change.org for Stanley Cohen. Stanley reports he has already put on a $600k defense on the charges for nonpayment of the last 5 years of taxes. I’ve never understood why lawyers working for a cause they think righteous need to be paid so much; if it were so righteous, they wouldn’t require such high fees — they would do it for free. Stanley’s aggressive PR and twitter campaign more often than not seems just part of a fundraising effort. Stanley says he openly supports Hamas, a designated terrorist group. (Signing a petition does not persuade a federal district court judge but does facilitate fundraising through the mailing list created and made available to the sponsoring group). The mute swans in New York State — also subject to a petition at change.org — aren’t so lucky. Lend your voice to the underdog that truly needs your voice. Stand up against the murder of innocents. Don’t support or promote violence while purporting to stand against it. This petition — one of several — has 30,000 petitions but should not be overlooked because Governor Cuomo still needs to sign the bill passed this year that would require that DEC prove the actual harm before killing the swans. One week last December he vetoed 50% of the bills presented. For cutting-edge research on swans, to include mute swans, see the Abstracts at this 2014 conference. The tundra and trumpeter swans are indicated by the research to be the interspecies aggressors relative to the mute swan — just the opposite of what is claimed without scientific basis by proponents of the NY kill plan. On Monday, the family of 7 we have in my county came up behind me and glided at the same speed alongside my rowboat. It was a beautiful thing. This 173-age PhD thesis by Gayet from 2010 is also a useful portal into the literature. NYS DEC should embrace the 2-year moratorium. The request by some local sportsman that Cuomo veto the bill is misguided. Moving forward with the killing plan would be a public relations debacle for the NYS DEC, which we need to do so much important work in the State. If DEC moves forward, a suit to enjoin the “arbitrary and capricious” agency action would be brought pro bono because it is a righteous cause. Hint: a cause may not be righteous if it costs $600k. Heck, for that money, you could represent cigarette companies and kill 300,000 a year — and you could tell your supporters it was righteous because it was all legal. Attorney Stanley Cohen, the US-based lawyer for Blind Sheik Abdel-Rahman, is to be sentenced here tomorrow in Syracuse, NY for tax evasion. He says he was targeted by AUSA Gordon Kromberg. I have no idea whether that is true. But I figure if you avoid taxes on $3 million in taxes over the course of 5 consecutive years, it is surprising that it took them this long to act. It must be nice to be able to mount a $600k defense. AUSA Kromberg is the lead prosecutor, by the way, in the prosecution of “anthrax weapons suspect” (his defense counsel’s term) in US v. Ali Al-TImimi. I’ve never met Gordon and he’s only ever sent me a filed brief in the matter at my emailed request. The federal district court judge has numerous pending motions in front of him in the long pending and hard-fought Al-Timimi matter. I believe 911 imam Anwar Awlaki figures centrally in the sealed motions. I cannot prove that Attorney Cohen is wrong about being targeted. Indeed, I suspect he is right. Attorney Stanley Cohen, the Blind Sheik’s lawyer in the US, also represented the lead defendant in the Virginia Paintball case.FN/ That case separately prominently featured “anthrax weapons suspect” Ali Al-Timimi (once his name was unsealed) — but the inside baseball was that Ismail Royer had the leading role in the Virginia Paintball group. (Ali Al-Timimi then came to be represented pro bono by the daughter of the lead Amerithrax prosecutor, Daniel Seikaly. Attorney Seikaly was born in Haifa in 1948 and comes from a politically active Palestinian family; he came over from the CIA in mid-September 2001). Mr. Seikaly was the one who derailed Amerithrax with the leaks about the BS anthrax-smelling bloodhounds. The very minute Ali Al-Timimi’s townhouse was raided, 100 agents came here to Syracuse and simultaneously interviewed 150 people. Eight agencies, including the iRS, had been on the case for months. There had been 30 extensions of warrants. In July and August 2001, the doctor here had spoken alongside Anwar Awlaki and Ali Al-TImimi in Canada and the UK. At his core, Attorney Cohen must be a law-and-order type. A rebel wouldn’t come back into the country to report for jail. Stanley Cohen, who also represented Osama bin Laden’s son-in-law, to be sentenced Tuesday for tax offenses. “Am I someone who would intentionally, willfully sell government secrets or engage in activity with the intent to hurt America or American citizens? Absolutely not,” Cohen told NBC News. The Blind Sheik’s US lawyer is going to jail. I wonder if he thinks he was targeted in part because of the anthrax mailings. I am not Jewish and don’t follow politics — remaining focused on the “whoddunit” of the Fall 2001 anthrax mailings. But I’ve always been interested in the loquacious and tenacious Stanley Cohen because of his politically-motivated defense of the people on the peripheries (IMO) of the Amerithrax case, such as Blind Sheik Abdel-Rahman. I once noted to Attorney Cohen that I had read Clarence Darrow’s biography as a kid and so could appreciate his point of view. (Archibald Cox and Ralph Nader came to be my heros, rather than Clarence Darrow). I was always hoping Stanley had a moment to spare from his representing drug dealers, mass murderers and political activists to have a beer and ribs at “Dinosaurs” here and tell me what he really thought. He gets sentenced here in Syracuse on tax evasion this week. For example, he represented the fake doctor who was a listed author in the article published in JAMA on Nguyen’s anthrax infection. In October 2001, NATO forces raided the Saudi High Commission for Aid to Bosnia and seized before-and-after photographs of the World Trade Center, U.S. embassies in Kenya and Tanzania, and the USS Cole; maps of government buildings in Washington; materials for forging U.S. State Department badges; files on the use of crop duster aircraft; and anti-Semitic and anti-American material geared toward children. An employee of the Saudi High Commission for Aid to Bosnia and another cell member was in telephone contact with Osama bin Laden aide and al-Qaeda operational commander Abu Zubayda. The employee’s planned immigration to the United States was going to be sponsored by Dr. Hassan Faraj, who worked at the hospital where the first New York inhalational anthrax victim died. The doctor was a co-author of a leading article in the Journal of American Medical Association (“JAMA”) about the causes of the woman’s death. Dr. Faraj lived in the building next to Al-Timimi until 1999 when he moved to Brooklyn to take an internship at Lenox Hill Hospital in Manhattan. An arrest warrant issued for a former Falls Church, Virginia resident, Dr. Hassan Faraj, on immigration charges on June 29, 2004. He had been working as an intern and resident at hospital in Manhattan for the past three years. In an April 11, 2005 letter (provided to me by intelwire.com, an Assistant United States Attorney explained to a federal magistrate the “defendant had engaged in repeated fraud in pursuing a medical career in this country, including lying to obtain his Virginia medical license.” The Virginia medical licensing website, there is a Consent Order confirming that he had surrendered his license. His license in Connecticut was also allowed to expire that year after it had been granted. At his initial appearance on June 30, 2004, the defendant was released pursuant to an agreed upon bail amount of $100,000, co-signed by two sureties. In early November 2004, the government learned that the defendant had violated his pre-trial release conditions by making false statements in his August 2004 Virginia medical licensing application. The defendant made at least two false statements to the Virginia board: (i) falsely asserting that he had not engaged in any plea bargaining in any matter; and (ii) falsely asserting that he had never been censured or warned in regard to his medical background. The February 2007 Consent Order in Virginia explains that he had been warned about his job performance on February 28, 2003. The defendant engaged in similar fraud, the government explained, in his submissions to the Educational Committee for Foreign Medical Graduates, which regulates the practice of foreign medical graduates in the United States. Among other things, the defendant falsely asserted to the ECFMG that he was an intern at yet another hospital in Croatia in 1996, the Venograd Hospital. The defendant even went so far as to submit a fraudulent certification to ECFMG that he interned at Sestre Vinogradska (Sisters of Misericordy) hospital in Croatia from September 1, 1996 to January 31, 1997. – documents concerning the appearance of United States State Department identification. As noted above, when he was not sponsoring Al Qaeda operatives, he was serving as a listed author on an article in a prestigious journal addressing the epidemiological puzzle of the anthrax spores that infected a fellow Lenox Hill employee Kathy Nguyen — who worked in the stock room at MEETH. It seems that one never knows what one is hiding in the closet. Attorney Stanley L. Cohen represented Hassan Faraj. “The defendant had nothing to give and wouldn’t become one of their snitches,” Cohen told the press in November 2004. Attorney Cohen was the law partner of radical attorney Lynne Stewart, who represented blind sheik Abdel-Rahman. The blind sheik’s son, Mohammed Abdel-Rahman, was on Al Qaeda’s 3-member WMD committee. Mohammed was in frequent contact with the blind sheik’s paralegal, Post Office employee Abdel Sattar. He would use Lynne Stewart as a “dove” to send messages to his father. The blind sheik once bemusedly said that they’ll stop using doves when the US stops using secret evidence. Mohammed Abdel Rahman was captured on February 13, 2003 in Quetta, Pakistan, and that had quickly led to the seizure of anthrax spraydrying documents at the home of a bacteriologist and the raid on Ali Al-Timimi’s townhouse on February 26, 2003. According to the February 2007 Virginia Consent Order, two days later — “on or about February 28, 2003” — Lenox Hill had issued a warning to Dr. Faraj about his job performance. Those massive searches and numerous arrests would be enough to distract even the most committed doctor from their work. Graeme MacQueen, who has written a highly politicized treatment of the Fall 2001 anthrax mailings, seems unaware that the Blind Sheik’s lawyer Montasser Al-Zayat — along with various of Ayman Zawahiri’s detained confidantes in trial in Egypt — had announced Ayman Zawahiri’s intention to use anthrax to retaliate for the rendering of senior EIJ leaders.FN/ Al-Zayat came to Brooklyn to help with the Nosair trial and over the years was in regular in touch with the Blind Sheik’s paralegal Abdel-Sattar and Egyptian Islamic Group’s military commander. The Brooklyn imam Gulshair El-Shukrijumah translated for the Blind Sheik Abdel-Rahman. Gulshair El-Shukrijumah was a Saudi government employee and missionary whose son is now leading Al Qaeda’s plans to attack the United States, including New York City. If Graeme had read those reports — instead of first reading on the subject of anthrax in 2010 — in his 2014 book “2001 Anthrax Deception” he might have listed this announced intention to use anthrax as the first reason to be concerned that Al Qaeda was going to next use anthrax. The greatest deception is when we deceive ourselves as the result of not informing ourselves and taking advantage of available factual information. (Many people have busy daily lives that limits how much factual information they can process). Where do his advisors Meryl Nass, Barry Kissin and Frances Boyle mention those reports? For that matter, where do book authors like Guillemin, Willman, or Nadler? Or how about the fellow who thinks a First Grader wrote the anthrax letters? (I’m not kidding). Where does he discuss the reports. Put simply, Dr. Ayman Zawahiri was the planner behind Bin Laden and his confidantes had announced his plans to use anthrax against the US. This was known both by the decision-makers and those who read on the subject. People need to inform themselves of the facts in forming their views. There were four main reasons the al-Qaeda hypothesis was attractive to many people. (i) Al-Qaeda had been accused publicly by the President of the United States, and convicted in the media, of having carried out the 9/11 attacks. It seemed natural to many people that the same perpetrator would follow up with a second round of terrorist attacks. Soon after last week’s terrorist attacks, federal health authorities told public health agencies to be on the alert for ‘unusual disease patterns associated with today’s events,’ a bureaucratically phrased but nonetheless chilling hint of fear that the nation might be under biological attack. I am writing these posts as I read Graeme’s book. No sooner than I raise the issue, on the next page Graeme evidences some awareness of that announced intention. Perhaps the difference is that I am pointing to the EIJ military commander Mabruk (who was Ayman’s close confidante) and the Blind Sheik lawyer saying that Ayman Zawahiri was going to USE anthrax — rather than just acquire it. Below is an article today from Press TV, Iran’s television network, broadcasting in English round-the-clock. Based in Tehran. The Administration (to include the CIA and Secret Service advising Cipro) knew that Dr. Zawahiri’s confidantes had announced Zawahiri’s intention and active plan to use anthrax against US targets. Thus, to use that fact, without much more, as evidence that the neocons in the Administration were responsible is utterly baseless. Kevin Barrett might more usefully interview Montasser Al-Zayat and the other Zawahiri confidantes, including those who have lived for years in Iran, about Zawahiri’s anthrax program from 1999-2001. Did the same person write the powder-containing hoax letters to Howard Troxler of the St. Petersburg paper, Judith Miller of the New York Times (author of Germs), and to NBC’s Tom Brokaw as wrote the letters containing anthrax spores? The Troxler letter read: “Howard Troxler .. 1st case of disease now blow away this dust so you see how the real thing flys. Oklahoma-Ryder Truck! Skyway bridge-18 wheels.” Judith Miller is the author of the pre-9/11 book Germs. The reversed “N’s” is a fascinating objective detail to focus on given the nebulousness of other data points. For example, Atta is associated with Clearwater, 20 miles from St. Petersburg — although the connection did not come out for a half decade after 9/11. Similarly, the details of Atta and El-Shukrijumah’s connections to Sarasota, 38 miles from St. Petersburg, is still the subject of hard-found FOIA litigation. And one of the most famous connection to the area is whether there was a report of a sighting at a subway shop in the area. A customer sees someone he thinks matches an FBI photograph. Authorities search the city on the eve of a presidential visit. “Several minutes later, Tampa Police Capt. Bob Guidara stopped by the Subway for dinner. The customer told the officer of his suspicions. Two decades have passed since Emad Salem went deep undercover for the FBI and infiltrated the terrorist cell behind the first World Trade Center bombing in 1993. Now 64, with no job, no home equity and no pension, Salem has decided to talk about his past. In promoting his book, what can he tell us about the people who attended the Nosair trial? To summarize my view of Amerithrax and how they trace to Brooklyn in 1995 — and to put things simply — I am suggesting that Adnan El-Shukrijumah, son of blind sheik translator, is the anthrax mailer. He is now a head of Al Qaeda’s external operations. What can Emad tell us about Adnan? I am suggesting that Al Qaeda anthrax lab director Yazid Sufaat is the processor and simply has been slow in admitting it. A stubborn but affable chap, he has told me that the CIA is not going to hear it from his mouth. Note that Ayman Zawahiri and Atef went to Indonesia in June 2000 at a time Sufaat and Hambali were planning the anthrax lab and looking to recruit a scientist. Thus, the narrative about introductions by Hambali being made in 2001 seems some detainee’s fiction. As for whether Al Qaeda lab in Kandahar was using virulent Ames, rather than some other strain, I would refer you to Dr. Relman’s article in Science and the documents explaining the plan to decontaminate labs with insecticide. The plan was to paint the walls so they could be wiped down. As for the mailer, my vote is for Adnan El-Shukrijumah. This apple didn’t fall far from the tree — just interview his mom in Florida and see for yourself. The asthmatic and dimunitive Adnan was the son of the Blind Sheik’s translator in Brooklyn, at about the time when Dr. Ayman Zawahiri and Mohammed Islambouli visited. In September 2001 upon the planes attack on the WTC, Adnan El-Shukrijumah called his mom from KSM’s house and told her he was coming to the US. (She protested but he insisted). That residence was where Yazid Sufaat had stayed when he explained to KSM that both he and his assistants were vaccinated for their work with the virulent anthrax. We may learn more about El-Shukrijumah and his connections to Atta and the hijackers if the newspapers have success in their suit against the FBI in Florida. For those like researcher Milton L. who argued for a half decade that Sufaat was not working with virulent anthrax, Milton and others understandably appear not to have had access to read KSM’s detainee report and were just making rash assumptions that squared with their preconceptions. They then never bothered to correct their commentary and news reports. Milton in his 2005 treatise did not even disclose the first sentence in Rauf Ahmad’s 1999 letter to Ayman Zawahiri: “I have achieved the targets.” As a scholarly researcher, it was incumbent on Milton to disclose the sentence and then share his view that Rauf Ahmad was merely telling Dr. Ayman that he was making progress on his list of things to do. (Then people could have judged the reasonableness of the interpretation in light of the fact that had been Rauf Ahmad’s mission to acquire virulent anthrax). Milton reversed the order of the handwritten and typed letters and then Eric at the NYT mistakenly adopted that view. All the while, Milton had failed to make the actual correspondence available. We don’t need more spin or asserted conclusions — what we need is the transparency that comes about from uploaded documentary evidence. Much later, Joby at the Washington Post did a more thorough and insightful job on Rauf Ahmad’s role. But the proof in Amerithrax is going to have to be simply framed and start with the actual players — not historical background involving a cast of dozens of educated Salafist supporters of the Egyptian jihadists. Indeed, unfolding events in places like Iraq are of sweeping historical nature — there simply would be far too much detaill consuming intelligence analysts. Which brings us back to the news of the week. What insight is provided by the manuscript titied “Undercover” of the FBI’s informant in the WTC 1993 bombing? … about Adnan El-Shukrijumah and his father, the blind sheik’s translator? … about Abdel-Sattar, the post office employee who acted as the blind sheik’s paralegal? About Montasser Al-Zayat, who helped with Nosair’s defense? … about the subtilis expert Walied Al-Samarrai who was calling the apartment of the WTC 1993 mastermind/bomber up until the minute of the blind sheik’s arrest? I’ve suggested that Ayman Zawahiri and Mohammed Islambouli visited Brooklyn in 1995 while Adnan El-Shukrijumah was living there with his father. Can Emad Salem confirm that is correct? Abu Hamza secretly worked with British intelligence and advised Scotland Yard on terrorist activities in the years before he was convicted for inciting murder, his lawyer claimed yesterday. Joshua Dratel, the lawyer defending the Egyptian imam at his trial in New York, said documents from Scotland Yard showed Abu Hamza was in “constant dialogue with British security forces”. Former Secretary of State Hillary Clinton, so eloquent at Colgate, knows the name Mohammed Zawahiri and his potential significance to intelligence analysis well. Are there telephone recordings of phone conversations between Mursi (Morsi) and al-Qaeda Ayman Zawahiri that discussed the release of his brother? Wasn’t the release of his brother, Blind Sheik Abdel Rahman and other EIJ officials the motivation of the Fall 2001 anthrax mailings? His name is Dr. Abdel Reheem Ali and he is widely regarded as the most reputable source for all things Muslim Brotherhood in Egypt. Ali is also credited with revealing what could be extremely explosive evidence to be used in the upcoming trials of Muslim Brotherhood leaders in Egypt, to include former President Mohammed Mursi. That evidence reportedly includes recordings of phone conversations between Mursi and al-Qaeda leader Ayman al-Zawahiri. Abdel Reheem Ali: Recordings of Mursi colluding with al-Qaeda leader. Though what follows below should be considered a stand alone piece, some context may be added by reading Addendum M to our “Ironclad” Report. This addendum is about the familial relationship between Rifa’a El-Tahtawi, Mursi’s former chief of staff, and al-Qaeda’s number one, Ayman al-Zawahiri; these two men are first cousins. We must emphasize that while we have neither come into possession of these recordings nor heard them, we felt it warranted to report on this news because of the veracity of the source(s) that have done so already. Another reason is how the detailed descriptions of the contents of the recordings comport with other news that has been reported during Mursi’s tenure as president. Al-Bawabth News obtained recordings that took place between ex-president Mursi and Ayman al-Zawahiri. The details of the recordings ensured that Mursi would not arrest Jihadists or Takfirists during his tenure and to ensure that they continue their activity with absolute freedom. In addition, the agreement included opening military camps to train jihadists in Sinai. As we reported previously via Al-Nahar, when Tahtawi was asked about his relationship with his cousin, Ayman al-Zawahiri, he is said to have had no comment. If the reports about these recordings are correct, Tahtawi was very involved in the release of Mohammed Zawahiri from prison. This is significant not just because the two men are first cousins but because Tahtawi was an arm of Mursi. Formidable sources in private settings revealed the nature of the communication between the two sides. First, the release of Mohammed al-Zawahiri, the brother of the al-Qaeda leader through the intervention from Rifa’a Tahtawi, Mursi’s chief of staff. To also ensure the freedom of movement and preventing them from being watched. Extraordinary claims require extraordinary proof. Where are the recordings alleged by Shoebat to exist? If they exist, they should be made available — instead there is only this unsubstantiated claim. Without more, the story should promptly be dropped. Let the prosecutor or government come forward with such evidence if it exists. Mustafa Hamza has been charged with terrorism along with Zawahiri’s brother. Mustafa Hamza was the one in three way conversations with the Blind Sheik’s paralegal in which they were discussing tactics that might lead to the Blind Sheik’s release. The issue was also the focus discussion of a Arabic language publication of the Ann Arbor charity IANA which had its spin-off here in Syracuse. Did Mustafa Hamza know about Zawahiri’s anthrax planning? Mohamed Al-Zawahiri, founder of Al-Salafeya Al-Jihadeya and the brother of Al-Qaeda’s leader, Ayman El Zawahiri was detained for 15 days by the Supreme National Security persecution office, along with Al-Jamaa Al-Islamiya leader Mostafa Hamza, with accusations of joining a terrorist group and the disruption of national peace, state-owned MENA reports. Al-Zawahiri and Hamza were arrested after arrest warrants were issued for them. Both leaders were previously charged with similar accusations. Al-Zawahiri was accused of joining the Returnees from Albania terrorist group. He was sentenced to be executed before the court later overruled the verdict. Hamza was accused of planning the assassination of former president Hosni Mubarak in Ethiopia, but was later found innocent. [This dates when the key players were in Khartoum, Sudan]. It’s fascinating that the change of regime and then back again did not result in a massive leak of Egyptian security files. What materials unavailable today will become available to historians? I once told my friend who grew up down the street from Dr. Ayman that Montasser Al-Zayat must cooperate with Egyptian security to have had such access to Torah prison — and he said no way. By analogy, did this Rutgers history professor in his new book out this summer unearth any information pertinent to my quest for Dutch Schultz’ legendary missing millions? • Title:Prohibition gangsters : the rise and fall of a bad generation / Marc Mappen. The background of Mustafa Hamza as it relates to Amerithrax is as follows. Cairo -based writers of the Ann Arbor charity Islamic Assembly of North America (“IANA”) , Kamal Habib and Gamal Sultan, approached the blind sheik Abdel Rahman about starting a political party in early 1999. On March 1 and 2, 1999, Lynne Stewart and translator Yousry visited Abdel Rahman in prison. On March 9, following that visit, Abdel Rahman issued a statement rejecting a proposal that the Islamic Group form a political party in Egypt. That day, the Islamic Group military commander Mustafa Hamza — the fellow recently arrested and charged with terrorism — spoke with the blind sheik’s liaison, US Post Office employee Abdel Sattar. In March, Cairo attorney Montasser Al Zayat told the press that Ayman likely was going to use weaponized anthrax against US targets to retaliate against the rendering and detention of the Egyptian militants. The next month, the Blind Sheik’s publicist Sattar spoke with Taha, the IG head close to the Taliban and Bin Laden, in a three-way call with Cairo attorney Al-Zayat. Sattar also spoke on the telephone with Vanguards of Conquest spokesman Al Sirri (based in London). From the beginning, the weaponization of anthrax for use against US targets was inextricably linked to the detention of senior militant Egyptian leaders, including the blind sheik. It likely was a happy coincidence for Ayman Zawahiri, Mustafa Hamza and Mohammed Islambouli, that an active supporter of the Taliban — and associate of Bin Laden’s spiritual advisor, dissident Saudi Sheik al-Hawali — was a US biodefense insider. Al-Timimi was IANA’s lead speaker and had spoken alongside Anwar Awlaki and a Syracuse doctor in Canada and England in July and August 2001. Ali Al-Timimi was a graduate student in the same building where famed Russian bioweapon Ken Alibek and former USAMRIID head Charles Bailey worked at George Mason University. The three worked at the secure facility at Discovery Hall at the Prince William 2 campus. Ames anthrax researchers Dr. Alibek and Dr. Bailey headed a biodefense program funded by Defense Advanced Research Projects Agency (“DARPA”). Al-Timimi had a top security clearance and had previously worked for SRA International doing mathematical support work for the Navy. In 2000 and 2001, Timimi was a graduate student in computational sciences. His field was bioinformatics. Al-Timimi tended to travel to give speeches on interpretation of the koran only during semester breaks. Mohammed was arrested years ago in Spring of 1999, sharpening Dr. Ayman’s resolve to use anthrax against US targets in retaliation. Mohammed’s microbiologist sister Heba understandably cried herself to sleep with worry for months, even years, after his arrest — the family received no word of Mohammed’s whereabouts. The Muslim Brotherhood, after achieving power in the election, should have protected minority rights. At the same time, the military, after assuming power recently, should protect prisoner’s rights. In 1999 and the years following, the lack of news relating to his imprisonment was not in keeping with accepted standards relating to the humane treatment of prisoners. Given the absence of evidence against Bruce Ivins, my concern remains that Heba taught Tarek and Tarek was supplied virulent Ames by Bruce E. Ivins and wouldn’t answer my questions relating to Amerithrax when I wrote him (and yet his former Cairo Medical classmates had been recruited by Dr. Zawahiri). Who does Mohammed Zawahiri think was responsible for the Fall 2001 anthrax mailings? Who does microbiologist Heba think was responsible? Who does Al Qaeda spokesman Abu Ghaith say was responsible for the mailings? A different lawyer for the Blind Sheik, Stanley Cohen, represents Abu Ghaith in ongoing proceedings. Although I haven’t read the filing, the blind sheik’s lawyer Attorney Cohen appears to argue that Abu Ghaith was “tortured” on his trip over and yet his claimed proof reveals only hyperbole. When the word “torture” is used to describe a strip search (as with other detainees) or a long flight, the word loses its meaning. Such photographs would be necessary to avoid, well… false claims of torture. My young daughter recently pulled an all-nighter this week returning from overseas. International flights, jet lag and the business of the day often are like that. Abu Ghaith should have asked for an aisle seat and slept (longer than he did). Many people think airline food is torture. As for missing the bowl while peeing and being scolded — that’s a lot like being married. If Abu Ghaith wanted to travel first class and have extra leg room, then he shouldn’t have urged the killing of 4 million civilians using anthrax. The blind sheik’s famous complaint was that the guards didn’t cut his fingernails often enough. Why didn’t he just tear them like a lot of men do? Mass murderers (and their accessories after the fact and conspirators) should stop being such cry babies. It’s undignified. Claims of torture should be reserved for more suitable circumstances. (And, torture indeed does occur and the rights of those prisoners needs to be zealously guarded). Of course, on the issue of the duration of the interrogation, Attorney Cohen may have a more sound point and that can be considered under the relevant precedent as it applies in the context of a necessarily long international flight. It’s all academic given the videos of Abu Ghaith’s murderous rants — but the world would still benefit by learning what Abu Ghaith has to say. Abu Ghaith, a grown man, chose to be a chatty Cathy on the plane ride. Does the blind sheik’s lawyer representing him really think that excluding this or that statement will help? Does he really think that the statute of limitation applies to 911 and the conspiracy to murder Americans? Wasn’t Abu Ghaith understandably upset about facing life is prison — rather than being scolded for missing the toilet bowl while peeing? NEW YORK — Lawyers for Osama bin Laden’s son-in-law claimed in court papers Friday that he was tortured by the U.S. and asked a judge to dismiss the terrorism case against him. Abu Ghaith, 47, has been held without bail since he was brought to the United States in March to face charges that he conspired against Americans in his role as al-Qaida’s spokesman after the Sept. 11 attacks. Authorities say he had appeared in propaganda videos that warned of further assaults against the United States as devastating as the Sept. 11, 2001, attacks on the World Trade Center and the Pentagon that killed nearly 3,000 people. Abu Ghaith, who has pleaded not guilty, would be the highest-ranking al-Qaida figure to stand trial on U.S. soil since 9/11. In an affidavit filed to support a request to suppress a 22-page statement he made to authorities, the Kuwaiti-born Abu Ghaith said he left Afghanistan in 2002 and entered Iran, where he was arrested in mid-year and held by elements of the Republican Guard before he was detained in prisons and interrogated extensively. He said he was told by Iranian government officials that the U.S. government was aware he was being held in jail in Iran and that Iran had turned over a number of prisoners to the United States already. Abu Ghaith said he was released from Iranian custody on Jan. 11, when he entered Turkey, where he was detained and interrogated before he was released on Feb. 28. He said he was heading home to Kuwait on a plane to see family when the flight landed instead in Amman, Jordan, where he was handcuffed and turned over to American authorities. He said he had learned through other detainees and news sources over the years that the U.S. had engaged in waterboarding, beatings, freezing rooms, sleep deprivation, electrical shocking, the use of dogs and noise torture, humiliation while naked and other practices. “I believed that I was now in American custody, and I anticipated increasing degrees of physical and psychological torture, which terrified me,” he wrote. He said he was kept naked on the plane for several minutes as a man in military clothing photographed his body. “I was terrified, and I saw that there were several men on board, and at least one woman present, who observed me while I was naked from her location behind a partially-drawn curtain at the front of the plane,” Abu Ghaith said. I invited the blind sheik’s attorney (Mr. Cohen) to have some Dinosaur’s barbecue in the course of the proceedings on his indictment here in Syracuse. But in the rush of summer goings-on haven’t had a chance to follow up. Stanley is just doing his job in seeking to exclude Abu Ghaith’s statement and arguing statute of limitations. The fact that (without reading the papers) I think they are losing arguments is no reflection on the excellent defense he seems to provide his clients. Sometimes a defendant simply is undeniably gulity and worthy of life in prison. Osama bin Laden’s son-in-law said U.S. charges that he was part of a global conspiracy to kill Americans should be dismissed because prosecutors waited too long to file them. Sulaiman Abu Ghayth, a Kuwaiti indicted by Manhattan U.S. Attorney Preet Bharara’s office, is charged with plotting to kill Americans after the Sept. 11, 2001, attacks. He was captured as he sought to travel from Jordan to Kuwait by the Central Intelligence Agency and Federal Bureau of Investigation after a decade-long manhunt, the U.S. said. He was brought to New York in March. His lawyer, Stanley Cohen, said prosecutors missed the conspiracy statute’s five-year deadline to file any charges under U.S. law and also failed to specify any actions that furthered the alleged conspiracy after the 2001 attacks. Comment: Without reading Attorney Cohen’s brief, I do not know why he reasons the 5 year statute of limitation is not extended given Abu Ghaith’s absence from the jurisdiction and status as a fugitive. Syracuse native pleads guilty to planning violent jihad, hoping to form al-Qaeda branch in U.S.
Abukhdair was born in Syracuse on Oct. 3, 1987. Court documents do not say how long he lived in the area, but in 2007 he moved from the U.S. to Cairo, Egypt. Abukhdair wanted to demand the release of Sheik Omar Abdel Rahman and Aafia Siddiqui. Rahman is the alleged mastermind of the 1993 World Trade Center bombing, and Aafia Siddiqui is a Pakistani neuroscientist who reportedly shot at law enforcement agents looking into her bomb-making instructions. Para 24 explains the young man’s reasoning. His colleague had objected to the idea of kidnapping on the grounds that the US has a don’t negotiate with terrorists policy. KSM initially had the idea of the Planes Operation as leading to the Blind Sheik’s release — he was going to land and make his demand. OBL rejected the idea as not viable. The movie “Siege” was prescient in regard to the importance of the Blind Sheik and was must-see television after 9/11. That essentially is Dr. Zawahiri and Al Qaeda’s strategy. It is an incredibly stupid (and highly immoral) strategy which will not be judged kindly by history. Indeed, under their belief system, they are going to have to answer to the Big Guy. Abukhdair then noted that at least there would be an opportunity to shoot it out with police. In a time of fiscal crisis, the Council needs to find ways to avoid expenditures through pooling of resources. (The federal grant money could be spent instead on more cameras). The State Department has evacuated non-emergency U.S. government personnel from the U.S. Consulate in Lahore, Pakistan, and has warned Americans to defer all non-essential travel to Pakistan due to ‘specific threats’ to that mission, a U.S. official said. In the travel warning issued Thursday night, the State Department advised Americans to defer all nonessential travel to Pakistan. The sources said the chatter included Al Qaeda leader Ayman al-Zawahiri demanding that key leaders of the terror network in the Arabian Peninsula step up their activities in the wake of recent killings of top terrorists. If officials fear a liquid explosive and the threat is specific as to date, it seems that if they disclose the date, people can choose not to travel or have their loved ones travel on that date. A failure to disclose the date will put the government in a very awkward position in the event flights are targeted on those dates. Heba, Ayman’s microbiologist sister who taught Tarek (who worked alongside Bruce Ivins in the B3) should be ashamed of Ayman. Targeting civilians immediately causes one to forfeit the moral high road (in addition to one’s soul under Dr. Ayman’s belief system). Mohammed in Cairo should be kept under close surveillance. I’ve told Attorney Cohen, the blind sheik attorney from the US, that I think it will get worse for him before its gets better in the ongoing prosecution here in Syracuse. I sense that there will be a superseding indictment based on the arrest of Blind Sheik supporter Odeh and many others in connection with a North Carolina cigarette smuggling operation that included sales within the Northern District of New York in the Albany area. Those supporters of the Blind Sheik who do not believe in the murder of innocents — and even Blind Sheik bodyguard Nosair, the assassin and WTC 1993 plotter, is singing to a different drummer — may very well want to collect the $5 million reward and tell authorites what they know about Adnan El-Shukrijumah in Brooklyn during the 1993-1995 period. Often, intelligence analysis is who knew who, and sometimes with these matters of ideology the relevant relationships may date back years. As a criminal defense attorney, Attorney Cohen understandably sneers at the idea of anyone cooperating, but that’s the reality. People are going to act in their best interest. In connection with the ongoing prosecution of the Blind Sheik Attorney Cohen in Syracuse, the judge initially directed the status conference go forward tomorrow. But then Attorney Cohen wrote with an update and the status conference now has been canceled. It appears that Terrence Kinsella will file a notice of appearance on Attorney Cohen’s behalf. A short while ago I reached an agreement with Mr. Kinsella, who will enter my case as attorney of record, and in that regard I have executed his retainer agreement, and have satisfied his requirements in full. Inasmuch as Mr. Kinsella is in court today, I do not know whether he will file a formal Notice of Appearance by close of business today or tomorrow. Under these circumstances, I would ask the Court to continue the proceedings without the necessity of my appearance tomorrow. Mr. Kinsella apparently does not have the appearance of a conflict that the other former AUSA did. Attorney Kinsella, highly experienced, has been out of the United States Attorney Office since 2004 and so would have no potential conflict. It will be interesting to see if Attorney Cohen’s prosecution has the same appeal for fundraising purposes as Attorney Stewart’s did. Legal defense by someone as experienced as Attorney Kinsella won’t be cheap. For several months in the Spring of 2002, anthrax letter suspect Adnan El-Shukrijumah lived with Al-Hawsawi in safe houses in Karachi. Al-Hawsawi had the laptop with the anthrax spraydrying documents on it. After 911, Al-Hawsawi met with Abu Ghaith. Al-Hawsawi had helped the hijackers and received excess money wired from Atta a few days before 911. What did Al-Hawsawi and Abu Ghaith discuss? Blind Sheik Attorney Cohen today in an email notes to me that he represents Abu Ghaith. Abu Ghaith appeared on the famous video in early October alongside Bin Laden and Zawahiri claiming responsibility for 9/11. So perhaps the folks defending the blind sheik Abdel-Rahman would help out with Amerithrax not just from the Brooklyn end — but from the Afghanistan end. What does Abu Ghaith say about Al Qaeda’s anthrax project? Will Attorney Cohen be granted secret clearance needed to review classified documents? What has Abu Ghaith already shared back at the hotel and then the long plane ride here? Assuming Miranda is not an issue, I think Attorney Cohen will want to embrace what Abu Ghaith told his questioners — and Abu Ghaith cooperated — and argue that getting him to New York from Turkey via Jordan somehow did not comply with the rule of law. Please…. if anyone is ashamed for what they did, they shouldn’t have done it. A good rule of thumb in life is don’t do anything if you wouldn’t want your mom to know about it. Now in the case of the Boston marathon bomber and Adnan’s mother, we can see that the apple didn’t fall far from the tree. Those moms are pretty hard to shame. The problem ultimately is that these men had such lousy parenting that they lack moral values. The loss of innocent life means nothing to them. Abu Ghaith, in the book he published, may have come to grapple with the morality of Al Qaeda’s 2001 attacks and his views may have evolved from his claim that 4 million could be killed, to include women and children. (I don’t know yet, not having read his book). But if Abu Ghaith is not a truth-teller then it merely is acknowledgement that he has reason to be deeply ashamed. The United States Attorney in the Northern District of New York lost his sister in the Lockerbie bombing. Unlike these mass murderers, he has compassion for victims and took the job to vindicate the rights of the likes of Ottilie Lundgren and Kathy Nguyen. Hawsawi worked under KSM who in turn worked for Zawahiri. Al-Hawsawi was a facilitator for the 9/11 attacks and its paymaster, working from the United Arab Emirates, sending thousands to Bin Al-Shibh in the summer of 2001. After 9/11, he returned to Afghanistan where he met separately with Bin Laden, Zawahiri and spokesman Abu Ghaith. KSM worked closely with al-Hawsawi and it would make perfect sense that the computer is actually al-Hawsawi’s. The fact that the anthrax spray drying documents were on that computer, however, and that he had worked under for Al Sahab in Kandahar in 2000, serves to suggest that the undated documents predated 9/11, particularly given that extremely virulent anthrax was later found in Kandahar. At the same time, it suggests that Al-Hawsawi has personal knowledge relevant to anthrax. Hawsawi worked as a financial manager for Bin Laden when he was in Sudan. He was associated with Mahjoub, who was Bin Laden’s farm manager in Sudan. Mahjoub was the subject of the anthrax threat in January 2001 in Canada, upon announcement of his bail hearing. The day after Mahjoub’s bail was denied on October 5, 2001, the potent stuff was sent to US Senators Daschle and Leahy. The Washington Post explained that “What the documents and debriefings show, the first official said, is that “KSM was involved in anthrax production, and [knew] quite a bit about it.” Al Qaeda had recruited competent scientists, including a Pakistani microbiologist who the officials declined to name. “The documents describe specific timelines for producing biochemical weapons and include a bar graph depicting the parallel processes that must take place between Days 1 and 31 of manufacture. Included are inventories of equipment and indications of readiness to grow seed stocks of pathogen in nutrient baths and then dry the resulting liquid slurry into a form suitable for aerosol dispersal.” The Washington Post story notes that U.S. officials said the evidence does not indicate whether al Qaeda completed manufacture. The documents are undated and unsigned and cryptic about essential details. The unclassified memo below lists some of the contents of the computer that had the anthrax spraydrying docs. In addition to establishing him as paymaster for the hijackers, Al-Hawsawi’s computer disks reportedly also included lists of contributors worldwide, to include bank account numbers and names of organizations that have helped finance terror attacks. In press accounts, one unnamed government official confirmed that the information has yielded the identities of about a dozen suspected terrorists in the US. Thus, when former CIA Director Tenet says the anthrax planning was done in parallel in 9/11 and compartmentalization was done at the highest levels of Al Qaeda, Hawsawi’s laptop may be a graphic illustration. The first time that Hawsawi was asked to be come involved in operational activities was about March 2001, when he took his second trip to the UAE. Although Sheikh Mohammed did not use the word ‘operation,’ Sheikh Mohammed told Hawsawi that he would be purchasing items, receiving and possibly sending money, and possibly meeting individuals whom Hawsawi would contact or who would contact him. Sheikh Mohammed also told Hawsawi that his stay would be lengthy, so he should rent an apartment. Sheikh Mohammed said Hawsawi did not need cover because he was carrying a Saudi passport, and it was a common practice for a Saudi to rent an apartment in the UAE. In approximately August 2001, Hawsawi, with Sheikh Mohammed’s blessing, decided to take an English course. Sheik Mohammed told Hawsawi that he would be in contact with individuals called ‘Abd Al-Rahman (Muhammad Atta) and the “Doctor” (Nawaf al-Hazmi). Atta called Hawsawi four times while in the US. Hawsawi says he was never in contact with Hani or Nawaf while in the US. On September 9, Ramzi bin Shibh told the date of the planned operation and urged that he return to Pakistan. He flew out on 9/11 and after a night in Karachi, flew on to Quetta. Hawsawi stated repeatedly that he never conducted any activity of any type with or on behalf of Moussaoui and had no knowledge of who made Moussaoui’s travel arrangements. Documents, however, reportedly show that al-Hawsawi worked with the Dublin cell to finance Moussaoui’s international travel. Hamid Aich was an EIJ operative there who once had lived with Ressam, the so-called millennium bomber, in Canada. The indictment of Zacarias Moussaoui named al-Hawsawi as an unindicted co-conspirator. Moussaou had tried to call KSM and Hawsawi as witnessses. That indictment reported that al-Hawsawi was born in Jeddah, Saudi Arabia, on Aug. 5, 1968. Hawsawi had left Kandahar for Dubai by late June 2001. The Zacarias indictment alleges that on September 11, 2001, Mustafa Ahmed al-Hawsawi then left the UAE for Pakistan. Hawsawi has said that it was Qahtani who was to have been “the 20th hijacker” rather than Moussaoui. Qahtani, Hawsawi said, had trained extensively to be one of the “muscle hijackers.” Of Moussaoui, al-Hawsawi said he had seen Moussaoui at an al-Qaeda guesthouse in Kandahar, Afghanistan, sometime in the first half of 2001, but was not introduced to him and had not conducted any operations with him. At Moussaoui’s trial, the government pointed to FAA intelligence reports from the late 1990s and 2000 that noted that a hijacked airliner could be flown into a building or national landmark in the U.S., but viewed that scenario “as an option of last resort” given the motive of the attack was to free blind sheik Abdel Rahman. Flying a plane into a building would afford little time to negotiate. Zacarias Moussaou reportedly was in Karachi with anthrax lab tech Yazid Sufaat on February 3, 2001 when they bought air tickets through a local travel agency for Kuala Lumpur, Malaysia. They reportedly left on a flight for KL on February 8, 2001. Moussaoui began at the Norman, Oklahoma flight school on February 26, 2001. KSM says that Moussaoui’s inquiries about cropdusters may have related to Hambali and Sufaat’s work with anthrax. Another reason not to underestimate Hawsawi’s possible role in an anthrax operation is his contact with al-Marri. Al-Marri, who entered the country on September 10, 2001, was researching chemicals in connection with a “second wave.” Al-Marri was also drafting emails to KSM. Although al-Marri denies being in contact with Hawsawi, phone records show otherwise. Email evidence also confirms messages drafted by al-Marri to KSM. The fascinating and groundbreaking article this year by Susan Schmidt of the Washington Post on al-Marri notes that al-Marri picked up $13,000 in cash from al-Hawsawi. Al-Marri made the mistake of opening the briefcase containing the money in bundles and peeling off a few hundred dollars to pay his bail after being stopped on a traffic charge a couple days after 9/11. References to al-Hawsawi turned up in the Dublin, Ireland, office of a Saudi-backed charity suspected of having links to bin Laden upon a raid after 9/11 by Irish authorities. The fact that Hawsawi was in Dubai, United Arab Emirates as of late June 2001 — and this connection to the Dublin charity — may both be relevant in threading the anthrax needle. 1. Under the provisions of the Deputy Secretary of Defense Memorandum, dated 14 July 2006, Implementation of Combatant Status Review Tribunal Proceduresfor Enemy Combatants Detained at US. Naval Base Guantanamo Bay, Cuba, a Tribunal has been appointed to determine if the detainee is an enemy combatant. 3. The following facts support the determination that the detainee is an enemy combatant. a. On the morning of 11 September 200 1, four airliners traveling over the United States were hijacked. The flights hijacked were: American Airlines Flight 11, [[w:United Airlines Flight 175|United Airlines Flight 175, American Airlines Flight 77, and United Airlines Flight 93. At approximately 8:46 a.m., American Airlines Flight 11 crashed into the North Tower of the World Trade Center, resulting in the collapse of the tower at approximately 10:25 a.m. At approximately 9:05 a.m., United Airlines Flight 175 crashed into the South Tower of the World Trade Center, resulting in the collapse of the tower at approximately 955 a.m. At approximately 9:37 a.m., American Airlines Flight 77 crashed into the southwest side of the Pentagon in Arlington, Virginia. At approximately 10:03 aim., United Airlines Flight 93 crashed in Stoney Creek Township, Pennsylvania. These crashes and subsequent damage to the World Trade Center and the Pentagon resulted in the deaths of 2,972 persons in New York, Virginia, and Pennsylvania. b. According to United Arab Emirates General Postal Authority records, the detainee opended a Post Office Box, number 19738, in Sharjah United Arab Emirates on 24 June 2001. He opened the Post Office Box under the name Mustafa Ahmed Al-Hawsawi, date of birth5 August 1968. He listed his home address as 103 Shaikh Sultan Bin Saqer Street, Al-Butheena, Sharjah, United Arab Emirates. He listed his mobile phone as 050-5209905.
c. Recovered Western Union receipts show that on 8 September 2001, “9/11 hijacker” Mohamed Atta sent 2,860 United States dollars from Western Union, Safeway Store, 14100 Baltimore Avenue, Laurel, Maryland. The funds were received by the detainee at the Wall Street Exchange, Dubai, United Arab Emirates on 9 September 2001.
d. Recovered Western Union receipts show that on 8 September 2001, “9/11 hijacker” Waleed Al-Shehri sent 5,000 United States dollars from Western Union, Food Giant Store, 1009 Fairlawn St., Laurel Maryland. The funds were received by the detainee at the Wall Street Exchange, Sharjah, United Arab Emirates, on 10 September 2001.
e. Recovered Western Union receipts show that on 9 September 2001, “9/11 hijacker” Waleed Al-Shehri sent 5,000 United States dollars from Western Union TravelEx #7201, Currency Booth Room 2250, Logan Airport, Boston, Massachusetts. The funds were received by the detainee at the Al-Ansari Exchange, Sharjah United Arab Emirates on 11 September 2001.
f. Recovered Western Union receipts show that on on 9 September 2001, “9/11 hijacker” Marwan Al-Shehhi sent 5,000 United States dollars from Western Union Greyhound Bus Terminal #0406, 700 Atlantic Ave, Boston Massachusetts. The funds were received by the detainee at the Al-Ansari Exchange, Sharjah, United Arab Emirates on 11 September 2001.
g. “9/11 hijacker” Mohammed Atta (Atta) sent the detainee a package with Fayez Banihammad’s Automated Teller Machine card and checkbook. One check was endorsed but not filled in, and split from the checkbook. The Federal Express receipt for this package was recovered from a trash receptacle located at a hotel utilized by Atta. The receipt indicated that the package was sent to the detainee’s Post Office box in Sharjah, United Arab Emirates. h. On 11 September 2001, the detainee flew from Dubai, United Arab Emirates to Karachi, Pakistan via Pakistan International Airlines flight 212, according to United Arab Emirates immigration records. i. A handwritten 19 page telephone and address book was found in a laptop computer case associated with the detainee. The address book contained contact information of numerous al Qaida operatives. The document was discovered where a senior al Qaida operative was captured. j. A laptop computer hard-drive associated with the detainee contained al Qaida expense reports from February 2002 to April 2002.
k. A laptop computer hard-drive associated with the detainee contained detailed information for the families of al Qaida operatives. l. A laptop computer hard-drive associated with the detainee contained detailed family information of 22 Yememi al Qaida operatives along with the the status of the operatives. m. A laptop computer hard-drive associated with the detainee contained al Qaida expenditure data from 1 January 2002 to 31 December 2002.
n. A laptop computer hard-drive associated with the detainee contained a list of al Qaida members who were killed or wounded. o. A laptop computer hard-drive associated with the detainee contained al Qaida family allowance information from November 2002 to October 2003.
p. A laptop computer hard-drive associated with the detainee contained detailed al Qaida expense reports from January 2002 to December 2002.
q. A laptop computer hard-drive associated with the detainee contained detailed al Qaida United States dollars fund serial account information from 1 January 2002 to 15 May 2002.
r. A laptop computer hard-drive associated with the detainee contained detailed al Qaida expense information through various incoming and outgoing rupee, Euro, riyal and dirham fund transactions for the period of 1 January 2002 to 31 December 2002. 4. The detainee has the opportunity to contest his designation as an enemy combatant. The Tribunal will endeavor to arrange for the presence of any reasonably available witnesses or evidence that the detainee desires to call or introduce to prove that he is not an enemy combatant and that is deemed relevant to that issue. The Tribunal President will determine the reasonable availability and relevance of evidence or witnesses. I am hoping to get the Blind Sheik’s lawyer Stanley Cohen — our modern-day Clarence Darrow — out to Dinosaurs Barbecue here to ask if I might obtain a copy of the trial exhibits from WTC 1993/ 1995. There just is no reason discussion of Amerithrax needs to be so uninformed — no reason people can’t get on the same page (and then actually read the page). For example, I would love a copy of Exhibit 818 in United States v. Salameh detailing the calls from subtilis expert Walied Samarrai to the number associated with Ramzi Yousef right up to the time the Blind Sheik was arrested. For his part, Attorney Cohen is hoping to retain Donald Kinsella, Esq., former AUSA at United States Attorney’s Office NDNY. Attorney Kinsella was a Trial Attorney at US DOJ Organized Crime and Racketeering Strike Force, Assistant Attorney General at NY Statewide Organized Crime Task Force, and Assistant District Attorney at Madison County District Attorney’s Office. We saw that Tom Connolly, a former DOJ prosecutor, was very effective on behalf of Steve Hatfill. Attorney Cohen writes the judge that he hopes to finalize the retainer agreement today. Who does Attorney Cohen think was responsible for the anthrax mailings? He argued in October 2001 that BIn Laden was not responsible for 911. That was mistaken but I can appreciate that Bin Laden had denied responsibility at the time. FBIS is a CIA database that was freely available to the public in 2001. Thus, the profilers in Quantico, if allowed to use the internet, would have been able to pull the previous statements about anthrax made by the Egyptian Islamic Jihad commander Mabruk, the EIJ shura member Al-Najjar, and the blind sheik’s lawyer Montasser Al-Zayat who was in regular contact with the Postal employee in the NYC area who served as the Blind Sheik’s paralegal. Now FBIS is accessible through the paid service DIALOG and the name World News Connection. Interview with Egyptian Islamist Lawyer Muntasir al-Zayyat by an unidentified correspondent in Cairo; date not given(Al-Zayyat) I hope that it will not do so. The United States will intensify its pursuit of Bin-Ladin and al-Zawahiri in the coming stage to arrest them. (Al-Zayyat) …. It is not an easy task, especially in light of information that Bin-Ladin’s organization has biological and chemical weapons. I believe that he will resort to these weapons and use them against US targets because of the constant pressure on him. If Taleban abandons him, it will lose its unique character of commitment to shari’ah and to the protection of the Islamic movements’ leaders. It is primarily a revolutionary movement that achieved sole dominance of 90 percent of Afghanistan in record time. Many revolutionaries have joined it and its image would be severely shaken if such a case does happen. (Al-Zayyat) Bin-Ladin’s departure from the mountains of Afghanistan will be the beginning of his end. It will become easy to monitor him if he does leave. Whichever country he goes to will sacrifice him at the first opportunity, regardless of any agreement concluded with it. Bin-Ladin is not thinking of going to Iraq because Saddam Husayn cannot be trusted. There is no safety outside the areas inside Afghanistan where he is now living. (Al-Sharq al-Awsat) How are the IG’s relations with Bin-Ladin now? (Al-Zayyat) The IG has good relations with Bin-Ladin but this does not reach the level of the marriage that binds Bin-Ladin and al-Zawahiri. The IG does not take part in operations carried out by Bin-Ladin’s supporters. (Al-Sharq al-Awsat) In view of the Egyptian authorities’ positive signs toward Dr. ‘Umar ‘Abd-al-Rahman, the last of which was allowing his family to travel to see him, do you expect that a demand will be made soon to have him handed over to Egypt? (Al-Zayyat) Dr. ‘Abd-al-Rahman is suffering terribly in his US prison. In his latest telephone call last week, he complained to his wife and son about the ill treatment he was receiving, the deliberate persecution, and the paralysis in his right hand. Therefore I hope that he will return to Egypt and be tried there as an Egyptian citizen, especially after his role in and support for the initiative to stop violence and in convincing the leaders abroad to adopt it. The declaration last March was made after Shaykh ‘Umar’s blessing. (Al-Sharq al-Awsat) In your view, what will be the IG’s stand toward the United States if the shaykh suffers some mishap inside prison? (Al-Zayyat) Shaykh ‘Umar’s death in prison will not be in the interest of the United States. If this does happen, it will have a bad effect and increase the hatred. It will result in something that we do not like. It could prompt the IG to change its stand toward the United States and its interests. (Al-Sharq al-Awsat) An increasing number of the groups’ leaders and members have been extradited to Egypt. What is your explanation for this and do you expect the extradition of the fundamentalist movements’ leaders to continue? (Al-Zayyat) Around 20 defendants from the Jihad Organization have been extradited to Egypt. We do not rule out more extradition in light of the present circumstances, especially the difficult position facing the Islamic movements’ leaders abroad as a result of the security globalization and the US mobilization of this globalization’s mechanisms to pursue the groups’ leaders and members in various European countries. This forces these leaders to look for new strategies for dealing with globalization so as to be safe from pursuit. The most important strategy is to explain the difference between Islam and terrorism. I believe that those residing in Europe who have asked for political asylum have no connection with the violence that had taken place in Egypt. Inquiries may be directed to NTIS, US Dept. of Commerce. (FBIS Translated Text) In the second-biggest trial of fundamentalist organizations in Egypt, since the Jihad Organization trial of 1981 that followed the assassination of late Egyptian President Anwar al-Sadat, the leading defendants being tried by the Higher Military Court at Haekstep base north of Cairo gave new information about an international organization whose policies were in accord with what has been attributed to Bin-Ladin, especially in the matter of attacking US interests around the world, particularly US embassies in the Middle East, Africa, and Southeast Asia. The Egyptian security services have continued their investigations in the Returnees from Albania case throughout the past four months. More than 20,000 pages of investigation report contain the defendants’ detailed confessions to the nature of their anti-regime activities, violent acts inside Egypt, and plans to threaten the state’s stability. The defendants’ confessions brought many surprises and details about the violent groups’ role, the extent of their activities abroad, and the political ambitions they were pursuing through their banned activities. Al-Sharq al-Awsat has read the investigation papers. The first thread in this case came with the arrest of defendant Ahmad Ibrahim al-Najjar in Albania, where he had fled after being sentenced to death in the Khan al-Khalili case in 1994 (date as published). Once al-Najjar was captured, members of the organization began to fall one after another. He revealed the names of a large number of his partners and gave detailed information about the support he got from the Islamic Jihad Organization’s leaders, foremost among them Ayman al-Zawahiri, ‘Adil ‘Abd-al-Majid, and Tharwat Salah Shihatah, who lives in Britain. Al-Najjar, who was sentenced to death in absentia in 1997 (date as published) in the case of the attempt to blow up Khan al-Khalili in central Cairo, said: The confrontation with the United States is a challenge that concerns not only Ayman al-Zawahiri or Usamah Bin-Ladin but the entire Islamic nation. Al-Najjar is among the 12 defendants accused of membership in the Jihad Organization who were extradited from Albania to Egypt last July. Another defendant extradited from Bulgaria to Egypt is also being tried before the court, whose sentences cannot be appealed. Nonconventional Weapons (subhead) The most controversial point in the confessions of the defendants from the Albanian fundamentalist group was the confirmation that pro-Bin-Ladin elements had obtained germ and biological weapons by post at a cheap price. Factories in the former Eastern Europe supply viruses that cause fatal diseases, such as E-Coli and Salmonella, without checking the identities of the purchasers. The important thing for them is payment of the invoice in advance. One of the organization’s members secure an offer to supply samples of anthrax gas (as published) and other toxic gases from a factory in a Southeast Asian country. The germs were offered at a price of $3,685, including shipping costs. A laboratory in Indonesia exported serums to the Islamic Moro Front, which has close ties with pro-Bin-Ladin groups and with Arab Afghans and Balkans (as published). It is believed that the Moro Front has large quantities of toxic gases. In another part of the investigation the defendants said that a laboratory in the Czech Republic had agreed to provide samples of the lethal butolinum germ at $7,500 a sample. The laboratory did not query the purpose for which this lethal substance would be used. The security services’ report on this point said that it is possible to use a microscopic quantity of these viruses (as published) to kill hundreds of people by inhaling it or eating contaminated food. The security services monitored contacts that elements abroad made with members inside the country to urge them to carry out new operations against police officers with the aim of undermining security. The security authorities exerted great efforts to monitor these elements and succeeded in getting back 12 leading members from Albania, another group from Arab and African countries, in addition to defendants seized in the (Nile) Delta area as they were preparing to carry out new operations, specially the al-Minufiyah group. The investigations conducted by the security services and the Higher State Security Prosecution Office with the defendants revealed a number of new changes in the Islamic groups’ ways of action and therefore the means of confronting and monitoring them. The defendants’ confessions showed that the organizations adopted new mechanisms, most noticeably the following: They expanded the scope of their targets. They stopped limiting them to Egyptian and Arab figures and installations and included the interests of the major powers, specially US and French interests, because of their involvement, according to the defendants, in the pursuit of the organization’s members inside and outside their territories. According to defendant Sa’id Salamah’s confessions, targeting these countries’ interests was bound to have a massive media value, and this would confirm the organization’s capabilities, which some quarters had begun to doubt. They diversified the targets and did not limit them to the blowing up of installations. This change included the kidnapping of figures and hostages “so as to bargain with the ruling regimes and security services for the release of the detained members of the Islamic Group (IG) or other pro-loyal groups, as defendant Ahmad Ibrahim al-Najjar said in his confessions. They launched joint action with other groups and organizations, both local groups and others operating outside their countries. They sought to reduce the ideological and jurisprudential differences between the various groups that were active in armed action. The defendants’ confessions revealed that coordination was indeed made between the main groups of Jihad, the Vanguards of Conquest, the IG, and the groups that split from it. Meanwhile, this new action was carried out under the umbrella of what was called the Army for the Liberation of Islamic Holy Places, which is reportedly led by Usamah Bin-Ladin, who has become the highest organizational term of reference for all the jihad groups. For years, I have urged that the son of the Blind Sheik’s translator, Adnan El-Shukrijumah, who left Brooklyn for Florida in 1995 during the prosecution of the Blind Sheik Abdel-Rahman, was the anthrax mailer. His co-conspirator, Al Qaeda anthrax lab head Yazid Sufaat, does not deny to me Al Qaeda’s responsibility for the Fall 2001 mailings. What can former postal worker Mr. Abdel Sattar, the paralegal for Blind Sheik’s lawyer in the US, Lynne Stewart, tell us about Gulshair, the Blind Sheik’s translator, and Gulshair’s son, Adnan El-Shukrijumah. Adnan is now the head of Al Qaeda’s external operations. Is the reason Adnan does not admit it because his sister Aidah, a hospice worker, would be ashamed that Adnan killed elderly Ottilie Lundgren, who by any account was a total innocent? That Adnan killed Kathy Nguyen, who worked at the hospital stocking supplies? Did that make Adnan feel manly? Did that help overcome his feelings of inadequacy in his life? Did that make his mom proud? If I were him, I wouldn’t brag about those letters either. He understandably is ashamed as is Yazid (although he puts on a cheerful front). In his heart, Yazid knows that his soul is lost because Ottilie and Kathy and the others were total innocents in the eyes of Allah (which is the construct of their belief system). These religious zealots by no stretch of the imagination have the moral high ground. A co-defendant in the trial of Lynne F. Stewart, a lawyer accused of aiding terrorists, testified yesterday that for several years it was “normal procedure” for him to send letters containing messages from Egyptian militants to a convicted terrorist client of Ms. Stewart’s in prison. The defendant, Ahmed Abdel Sattar, is facing the most serious charges in the federal trial in Manhattan, including one count of conspiracy to kill and kidnap in a foreign country, which carries a maximum sentence of life in prison. Mr. Abdel Sattar is accused of secretly coordinating communications between violent Islamic fundamentalists in Egypt and their spiritual leader, Sheik Omar Abdel Rahman, a client of Ms. Stewart’s who is serving a life sentence for a failed terrorist plot inNew York. Mr. Sattar, taking the stand in his own defense, said that he routinely and openly wrote letters that were carried to the sheik by Ms. Stewart and other lawyers on the defense team whenever they visited their client in prison, even after the government imposed limits Mr. Abdel Rahman’s communications in 1997. In late 1998, Mr. Sattar said, some of the sheik’s best-known militant followers began to call him from overseas on his home telephone, and he included messages from them in his letters to the sheik. Mr. Sattar, 49, was born in Egypt but has lived in New York since 1982. He is a postal worker in Staten Island and served as a court-approved paralegal in the 1995 trial in which Mr. Abdel Rahman was represented by Ms. Stewart. Mr. Sattar said he had “tremendous respect and admiration” for Mr. Abdel Rahman because he is “a stand-up man” who tenaciously resisted the government in Egypt. Nor did Mr. Sattar condemn the terrorist violence that the sheik’s followers carried out until 1997 against the Egyptian government. But he insisted that he had made hundreds of phone calls over several years to help Mr. Abdel Rahman’s followers communicate with the sheik and with one another “as a favor” to the fundamentalists, and not because he was ever a member of their organization, the Islamic Group. It has been identified by the State Department as terrorist. When Abdel Sattar first met the Blind Sheik’s lawyer Lynne Stewart, he was active in his neighborhood mosque. Adnan El-Shukrijumah’s father, Gulshair, was an imam at the al-Farouq mosque where the Blind Sheik preached. How well did Ahmed Abdel Sattar know Gulshair? decade ago when Ahmed Abdel Sattar first met the defense lawyer Lynne F. Stewart, he was leading an unremarkable life, working for the Postal Service in New York and active in his neighborhood mosque. He was appointed as a paralegal for Ms. Stewart in a 1995 terrorism trial. After that, Mr. Sattar began to pursue goals that tended toward the grandiose. He embarked on an extended round of telephone diplomacy that put him in touch with Islamic militants in Europe, Egypt and Afghanistan, which he described in eight days of testimony at his trial in Manhattan federal court, where he and Ms. Stewart are facing charges of terror conspiracy. From the improbable base of the Staten Island apartment he shared with his wife and four children, Mr. Sattar said, he undertook a one-man global campaign to negotiate a permanent peace in more than two decades of fighting between the Egyptian government and the fundamentalist Gamaa Islamiya or Islamic Group. Among the attacks attributed to the group in its drive to topple President Hosni Mubarak and bring Islamic rule to Egypt was a 1997 rampage at Luxor that killed 58 tourists. At one point in 2000, Mr. Sattar testified, he tried to arrange by long-distance telephone the escape to exile of an Islamic Group fighter who was on the run in southern Egypt. The plans went awry and the man, Alaa Atia, was killed by Egyptian security forces. The high point of Mr. Sattar’s self-appointed diplomacy was a two-page peace plan, which his defense lawyers presented in court. Mr. Sattar said he gave the plan to a friend who had a relative who was a high-ranking Egyptian security official. Mr. Sattar admitted that no officials from Egypt or the United States were ever directly involved in the initiatives he said he undertook. But the F.B.I. began to wiretap Mr. Sattar’s telephone in 1993 and produced thousands of hours of audio recordings of his calls, the main evidence at the trial. Now that testimony has concluded after six months, it is clear that Mr. Sattar is the center of the government’s case against him, Ms. Stewart and a third co-defendant, Mohamed Yousry, an Arabic translator. Ms. Stewart and Mr. Yousry are accused of smuggling messages out of prison from one of her clients, Sheik Omar Abdel Rahman, an Islamic cleric. But Mr. Sattar is said by prosecutors to have provided the link to violent Egyptian followers of the sheik, who is serving a life sentence in a federal prison for inspiring a thwarted 1993 bomb plot in New York. Mr. Sattar was a court-appointed paralegal in the 1995 trial where Mr. Abdel Rahman was represented by Ms. Stewart. Mr. Sattar’s testimony revealed his expanding sense of importance as he became immersed via conference call in the murky internecine intrigues of the Islamic Group. Having left Egypt as a young man to adopt a workaday life in the United States, Mr. Sattar saw an opportunity through the calls, his statements showed, to become a player in the convulsive politics of the country he had left behind. He was pleased to be the only channel of communication between the Islamic Group and the sheik, who was in solitary confinement and incommunicado, through letters he sent to prison with Ms. Stewart. Often, Mr. Sattar admitted, he exaggerated his role to the Egyptian militants, telling them he was meeting directly with the sheik, even after prison restrictions barred him even from speaking with Mr. Abdel Rahman by phone. In his enthusiasm, Mr. Sattar was less than prudent about who was on the other end of the line. One frequent caller, Rifai Taha, was an Islamic Group military leader who had been an associate of Osama bin Laden’s since at least 1998 and was in Afghanistan, probably with Al Qaeda, at the time of many calls. Mr. Taha was advocating an end to a cease-fire that the Islamic Group had observed since 1997. Prosecutors showed that Mr. Sattar knew of threats Mr. Taha had made, including one in February 1998 that he signed with Mr. bin Laden saying it was the “duty” of all Muslims to murder Americans. Mr. Sattar repeatedly warned callers to be cautious because his phone line was probably tapped. Yet he disregarded his own advice, allowing himself to be drawn ever deeper into a raging debate between Mr. Taha and other fugitive militants over whether to return to war in Egypt. He said he spent thousands of dollars a year on phone calls and struggled to keep up with the bills. In the vast volume of transcripts that prosecutors presented, they never demonstrated that any violence resulted from Mr. Sattar’s calls. And in the end, the Islamic Group did not abandon its cease-fire. Mr. Sattar, 45, came to the United States in 1982 to avoid persecution in Egypt for his outspoken Islamist views. Three years later he married Lisa Schreiber, an American Catholic, and became a naturalized citizen in 1989. In 1993 his wife converted to Islam. On the stand he spoke vehemently, emphasizing his points with sweeps of the hand, and argued with the prosecutor, Christopher Morvillo. “I yearn to see Islam,” he said, describing his political goals for Egypt, although he insisted he did not condone violence, except for what he called self-defense. Yet under cross-examination, he often appeared to be dodging. Mr. Morvillo asked him if Mr. Taha considered the United States an enemy. One diplomatic initiative that Mr. Sattar declined came in a call from Mr. Taha shortly after the bombing of the destroyer Cole in Yemen on Oct. 12, 2000. Without explicitly claiming a role in the attack, Mr. Taha suggested Mr. Sattar should use it as propaganda to pressure Washington for Mr. Abdel Rahman’s release. The hard work of NYPD Intelligence and their colleagues and sister agencies has led to the arrest of a man named Odeh this month. Blind Sheik Abdel-Sattar had invested $10,000 in his business years ago. Odeh reportedly is a vocal supporter of the Blind Sheik. What can Odeh tell us about Adnan El-Shukrijumah dating back to 1995, before he left for Florida? Just because the FBI botched Amerithrax — mistakenly declaring it solved when it wasn’t — doesn’t mean that NYPD Intelligence can’t go ahead and solve the case. I want to commend Attorney General Schneiderman and Homeland Security Investigations Special Agent in Charge James Hayes and their personnel for their outstanding work on this important case. I also want to thank our Operation Sentry partners, including the State Police of Delaware, Maryland, and New Jersey, and of course our own Deputy Commissioner for Intelligence David Cohen, Assistant Chief Thomas Galati, the lead investigator on the case Detective Sean Foley, along with Intelligence Research Specialists from the NYPD Intelligence Division. The core mission of the NYPD’s Intelligence Division since it was reconstituted in 2002 has been to prevent another terrorist attack against New York City. And so far, so good. We haven’t been successfully attacked since 9/11. But it’s not for the lack of trying. The terrorists keep coming back. We have thwarted multiple plots against the city through a combination of efforts by our Intelligence Division, through joint efforts with our federal partners and intelligence agencies overseas, and sometimes, we’ve just been lucky. This case started because we were being vigilant about terrorism. Through combined efforts of detectives and intelligence analysts, we discovered that individuals who were on our radar for links to known terrorists were engaged in a massive raid on the New York Treasury in the form of cigarette tax avoidance. The association of some of the suspects in this case to Ari Halberstam’s killer, the “Blind Sheik,” and a top Hamas official concerned us gravely. Take, for example, Yousef Odeh. Earlier this year, he said he had sold 15,000 cartons of untaxed cigarettes worth about $780,000 to three customers alone. Odeh also had a business selling baby formula. And one of his investors in the 1990s was Omar Abdel Rahman, the Blind Sheikh convicted in the plot to bomb a number of New York City landmarks. Odeh also had personal and financial ties to Ahmed Abdel Sattar, who served as spokesman for the Blind Sheikh during the 1995 landmarks trial, and who had conveyed the Sheikh’s messages to his followers in Egypt and Afghanistan. According to transcripts of his own 2004 trial, Sattar stated that he invested $10,000 of the Blind Sheikh’s money in Odeh’s baby formula business and was in phone contact with Odeh. In that trial, it was also alleged that Sattar used Odeh’s phone to receive sensitive calls from a fugitive leader of the extremist Egyptian Islamic Group shortly to discuss what threats they should make against the United States government in the wake of the bombing of the U.S.S. Cole. Sattar, who himself worked with Odeh in the baby formula business, was convicted in 2005 of conspiracy to kill and kidnap persons in a foreign country and for soliciting crimes of violence. Mohannad Seif is a sub-distributor in this case who sold untaxed cigarettes directly to bodegas and other small retailers. Seif was of interest to the NYPD because of previous intelligence reporting, and because we believe that he lived for some time in the same three-story Brooklyn walk-up occupied by Nasser al-Khatib, the personal secretary to Mousa Abu Marzouk. Marzouk was the de facto leader of Hamas in the late-1980s and early-1990s and a central fundraiser for the organization in the United States. Marzouk was deported in 1997 and remains a top Hamas official in Egypt. While it hasn’t been established yet where the illicit proceeds in this case ended up, we’re concerned because similar schemes have been used in the past to help fund terrorist organizations like Hamas and Hezbollah. Our federal partners continue to investigate the money trail. Meanwhile, we’ve arrested the principals in this massive scheme and the hemorrhaging of tax revenues they caused. We have a responsibility both to protect the taxpayer and to make certain we are neither targeted nor exploited by terrorists. We’ve couldn’t have made this case without the dedication and skill of the people assembled before you, and others who could not be here. Again, my thanks to them all.